With training sessions designed just for you. We want you to be happy. Happy with your healthy body but also with the process that gets you there. That’s why we’ll encourage you every step of the way and come up with a bespoke plan that you will really enjoy. Based in the heart of Brighton and Hove, our fully-qualified personal fitness trainers work with you to achieve your goals, which can be anything from playing with your grandchildren to regaining your balance, or coping with the menopause. Our approach to personal training isn’t like everybody else’s, which is why we have such a loyal client base. 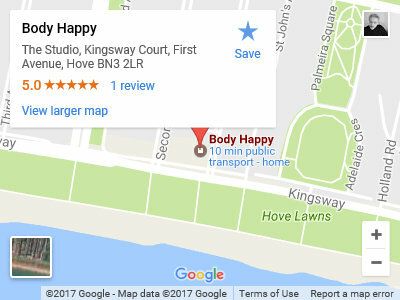 We are friendly, non-judgemental and supportive, and can work with you at home, at our fully-equipped fitness studio in Hove, or wherever suits you best. They say life begins at 40, and if that’s the case we specialise in helping people in the prime of life – because as far as we’re concerned there’s no good reason why that shouldn’t be exactly what your 50s and 60s are. In a nutshell it’s our job help people of all ages feel great about themselves, so whether you want to get active, stay independent, do more of the things you love, or simply make sure everything keeps working the way that it should, you’re in the right place. We also work with a chiropractor, a nutritional therapist, a mindset coach and other well-being specialists. Together we can bring about an amazing change in you, find out how by texting us today on 07786 557998 to arrange an introductory session. Why do we do it? Because putting a smile on your face keeps a smile on ours. Pop in to see Jenny and the team for a free consultation. What is personal fitness training? Well, for starters it’s personal and tailored to you. Your fitness, your lifestyle, your needs, your health – it’s all about you and your goals. If you want to make a positive change, we can help you. Once we’ve put together a personalised plan, we’ll work with you to make it a reality. And we’ll be there every step of the way to make sure your posture and technique is as good as it can be, so you can achieve more in a shorter space of time. What’s more we’ll make it fun along the way, by learning new techniques at every one-to-one session. Let us be your motivation, because together we can do great things. TO BOOK A FREE CONSULTATION. Jenny’s personal training sessions are fun, challenging and, as the name suggests, entirely personalised to your needs. As a busy person sometimes overwhelmed by too much to do, Jenny has made me realise that taking time to prioritise my health and wellbeing is vital. I now sleep better, look better and feel better. After an in depth consultation and analysis, Jenny devised a programme to focus on developing my core and upper body strength and on helping me improve my flexibility and balance. We train together for an hour each time, with each session being different from the last; this keeps things fresh and works all those lazy, tired muscles for a full body workout. I work about a third harder with Jenny than I would do on my own and it really makes a difference. She’s lovely, too – she makes me laugh and never judges me, embarrasses me or makes me feel awkward. Each session incorporates elements of strength training, Pilates, cardiovascular training and stretching. we can help you focus on posture and technique to ensure that you’re working at your best capacity and that you avoid injury. Training with us is challenging but not punishing. You will leave the studio feeling energised and motivated. The best way to contact me is to send a text message to 07786 557 998 as it is very difficult to answer phone calls during working hours. Alternatively, fill in the contact form and I'll get back to you as soon as I can.